Shredz64 is a modern day game for the Commodore 64 that makes use of the Playstation guitar controller hooked through the PSX64 interface. 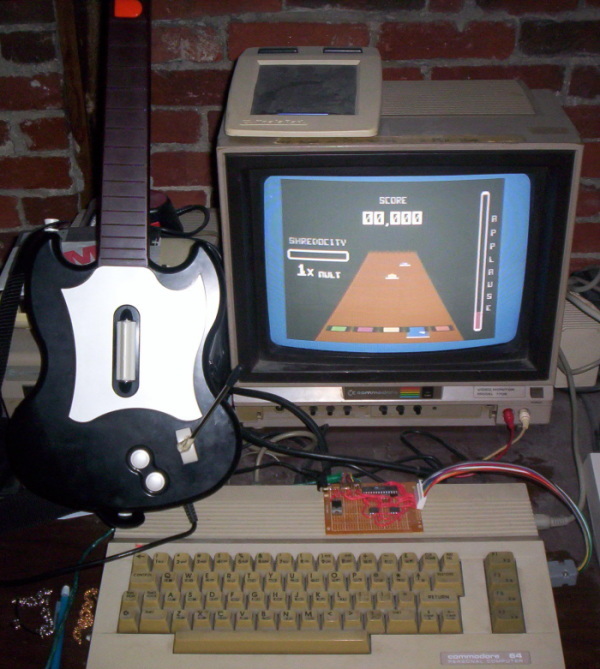 Its design is modeled against the popular “Guitar Hero” series, geared toward the ability to play along to your favorite C64 music on the guitar. Correctly played notes increase your score and applause meter, while incorrectly played notes decrease your applause meter. If the crowd stops applauding, you’re out! Additionally, Shredz64 features the “shredocity” meter that allows for extra points when you’re doing an awesome job shredding to your favorite chiptune. Watch Shredz64 in action or Download Now! The ability to play (many) SID files, including ones added by the player. The ability to edit “notes” (the buttons that scroll during gameplay) for both built in and imported songs. Pseudo 3D gameplay to give it the look and feel of a modern day game. High score tracking, 5 scores for each song. The ability to detect when the guitar is lifted up to activate shred mode. Further information and song downloads can be found at Synthetic Dreams.